Bartending Class in Maryland: What You Need To Know To Succeed! Looking for the best bartending class in Maryland? This page presents some of the basic information you need to know to in order to start your bartending career. 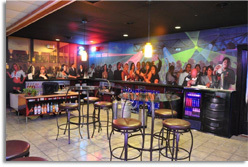 For decades Maryland Bartending Academy has been the premier Baltimore-Washington area bartending school. Whether you need to learn how to bartend with our basics of bartending, to learn how to manage a crowd to earn the best bartender wage, expert mixology techniques, or pick up some flashy trick bartending, MBA can help you gain the experience and the skills to start a new career or a fun second job. Do I Really Need A Bartending Class In Maryland? If you want to quickly find an ideal bartending career, then you absolutely do. Basically, if you want the knowledge and skills to find gainful bartender employment, earn a great wage, and have fun doing it. Bartending school is the very best way to make sure you earn the most, get the best job that fits you, and get employed quickly. Taking our bartending class in Maryland can entitle you to the best consideration for a job, and lets your soon-to-be employer know you have all the skills required to make a great bartender. Is Bartending College Right For Me? Nope. There are perfect bars out there for anyone. With your bartending class in Maryland, you will find out just where they are and how to land your dream bartender job. From a cozy neighborhood pub, to an exciting urban hotspot, bartending is an across-the-board easy way to make money and talk to people. You can bartend just as a way to make new friends because, as everyone knows, the person pouring the drinks is always popular! The best way to really see if bartending class is really the right way to go for you is to attend our FREE INTRODUCTORY CLASS. Get first-hand information on how you fit into this exciting world. What are the bartending laws in Maryland? Do I need a bartending license in Maryland? Do I need a bartending license in DC? Will you help me get bartending employment?